Good enough to record, cheap enough to chuck in the hold of a tour bus. Nice work, Mr Smith. Great distortion. Good build quality. Not brilliantly suited to shredders. The 245's clean voice is more than decent, but these pickups have also got a nice mix of bite and smoothness. This maple-topped mahogany body is a heavy beast, but it pays you back with tons of sustain. Serious guitarists are obsessed with length. No, not that kind. We're talking scale length, otherwise known as the measurement from the nut (not that one) to the saddle. Sounds like a pretty dry statistic of exclusive interest to guitar anoraks, but it's actually crucial to how a guitar handles. A 'Fender-style' 25½ inches will theoretically feel tighter than the bend-tastic response of a 'Gibson- style' 24¾ inches. "If you're in the market for a singlecut electric, the 245 is gunning for your wallet." Since 1985, when the company debuted its first model, the PRS Custom, Paul Reed Smith has been an awkward bugger, traditionally planting his scales at 25 inches on the nose, so the launch of the first 24½-inch SE model (except the Santana) is the most exciting length-related news we've heard in, ooh, months. Let's put the tape measure away and pick up a plectrum. Without getting bogged down in Les Paul comparisons, it has to be said that if you're in the market for a singlecut electric, the 245 is gunning for your wallet. It doesn't have the voluptuous arch of a Les Paul, but the classic singlecut materials of fat mahogany body and maple top are present and gorgeous, while the mahogany neck is set deep with a joint that looks built to last. Physical performance? It's strong. The neck itself is a bit of a bloater - PRS prefers the term 'wide fat' - but that's fine, because this beast is built for comfort, not speed. Half an inch might not make much difference on a sumo wrestler, but it's definitely noticeable when you're playing this guitar's board. Vibrato feels just a little more free and easy, and when you bend the G string hard towards the ceiling during a blues lead break, it doesn't fight you. It's an expressive player, in other words, which sounds best when you sit back on the notes instead of brushing past them on a moronic race to the top frets. Shred wannabes should jog on. There's nothing wrong with the clean tone here. It's warm, characterful and loaded with lengthy sustain, you can hear all the woods, and, like we say, there's welcome scope for fattening it up and thinning it down. Put a gun to our heads, though, and we'd dither between this and a similarly priced Epiphone Les Paul when it comes to reverb-drenched verse picking passages. Where this guitar pulls ahead - in our opinion - is with the distortion. It's loud, proud and not lacking in bite, but there's also a real smoothness to the gain of these pickups that marks them out from other units out there and totally reels you in. Some players aren't crazy about this distinctive calling card of PRS humbuckers (we remember being told by J Mascis of Dinosaur Jr that they "make everything sound like the Allman Brothers"), but many more are. This model has certainly got its own vibe, and you won't hear that phrase too often in the £649 price bracket. 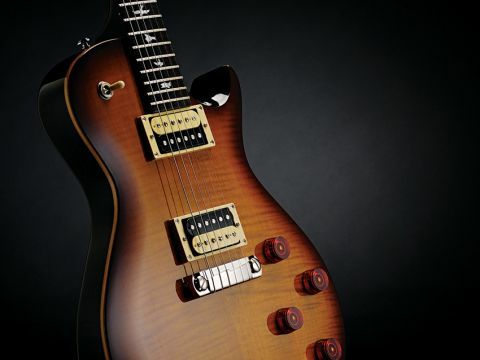 PRS models are hard to criticise, and this 245 is no exception. For its target market - feisty rock players who are a few bpm short of being termed 'shredders' - this guitar really knocks it out of the park.